Camel necklace inspired by an 8th-century figure of a camel from Tang-dynasty China. I’m a big fan of shiny things. Nothing brings me joy like sparkly stuff, and I love to wear a fair amount of bling, which won’t come as a surprise to anyone who’s been within reflecting distance of me on a sunny day. 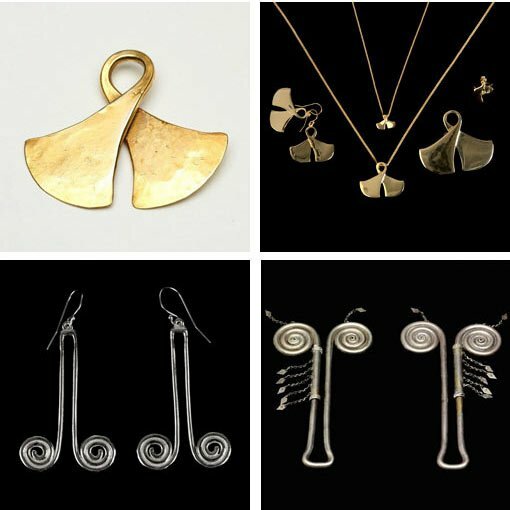 That would explain why I was hovering like Gollum over a display case in the Gallery Shop housing the Highlights Jewellery Collection – a new range designed to celebrate and reimagine some of the artworks in the Gallery’s collection. 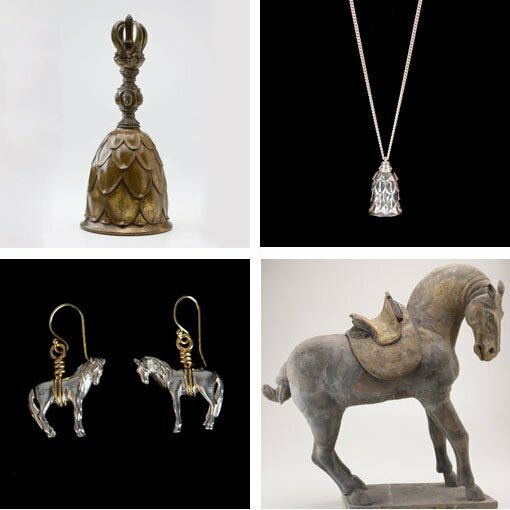 The Asian collection turned out to be the perfect focus for the first release of the range due to its superb three-dimensional works, and the jewellery draws on ceramic figures from Tang-dynasty and Wei-dynasty China, a Tibetan bronze temple bell and heirloom adornments from Indonesia. I met with shop manager Rebecca Allport and product developer Maryanne Marsh to ask some questions about the process, but when they laid the entire gleaming range out on the table, my laserlike professional focus was somewhat compromised. The Temple Bell pendant winks in the light as Rebecca tells me about the design process and how the Gallery’s Asian art curators were involved in the development. I do my best to take notes as it all seems very complicated. ‘Natural gravitation to the objects and sculpture in the collection’ – I definitely wrote that bit down, and I clearly remember ‘a large amount of refining line and symmetry’. I’m shown the working drawings by designer Virginia Rouse, of Pushmataaha, who was brought on board due to her very successful collaboration with the Gallery Shop on the jewellery created for the exhibition Afghanistan: hidden treasures from the National Museum, Kabul . The drawings and attendant notes about finding solutions for technical factors are detailed and fascinating, except Rebecca and Maryanne then insisted on draping the pages with the finished jewellery pieces to illustrate ‘the journey’, and I was unavoidably distracted. While I spent some quality time deciding whether I was better suited to the brilliant sterling silver or the 14k polished gold plate, it appears my notes were tampered with. They now contain references to ‘capturing and honouring the presence of the original artwork’ and ‘future plans to expand the Highlights range throughout the Gallery’s collection’, and ‘Holly please see me in the office for a chat about concentration skills’. As for me, I really don’t think I can narrow down my favourite until I’ve thoroughly tested all of the pieces with different outfits and in various lighting situations and over a number of occasions. It simply wouldn’t be professional of me otherwise. I understand that it might be difficult for some people to be this committed, this task-oriented, but in this case I really feel I have it in me to be a shining example.